NOTE: This is perhaps my all-time favorite hangout discussing citations! We followed two EvidenceExplained.com resources for this study group session that details how and why to construct layered citations for online images of original documents. 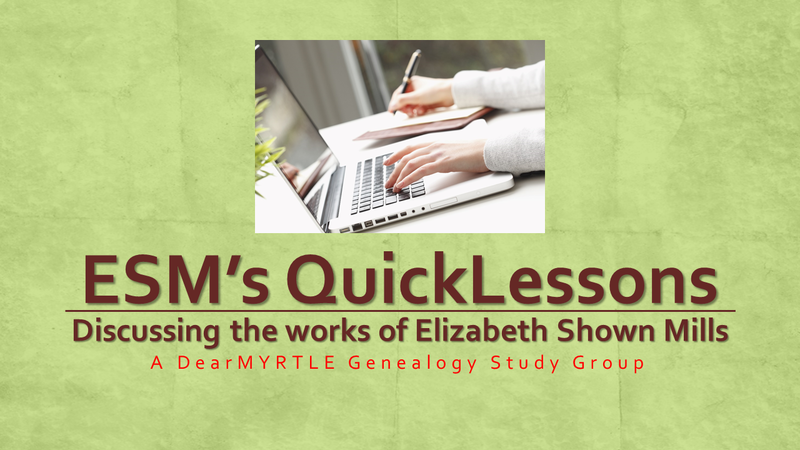 Elizabeth Shown Mills, “QuickLesson 12: Chasing an Online Record into Its Rabbit Hole,” Evidence Explained: Historical Analysis, Citation and Source Usage (https://www.evidenceexplained.com/content/quicklesson-12-chasing-online-record-its-rabbit-hole : accessed 30 Sept 2015). and possibly Layer 3 - Quirky things about the record set or website using [square brackets]. Use a connecting phrase between layer 1 and 2 such as "digital images database"
Inserting the " : accessed " after the URL is protocol, and it may help if you use the Internet Archive's Wayback Machine. Does the website actually cite the Family History Library film? Hilary Gadsby says "We do struggle with these websites that do not tell us where they got the original from. Ancestry FMP etc did not tell us that they obtained image from microfilm." Cary Bright says "In the perfect world, if you have the general url and the "correct" title of the record group, you should be able to find it with the bread crumbs you add with volume/year/album; page no and image/images. I think anymore of that needs to be part of the discussion in your analysis that it wasn't cut and dried." Patrick Shaul asks "For Online searches, should we not capture the search criteria? We would need the actual criteria used to recreate the capture." A lively discussion ensues concerning the difference between a research log and a citation. Ol' Myrt here sincerely hopes Elizabeth Shown Mills spots this one. I think she would be happy to see how we are learning through her example.